It’s got another Ernie Chua/Chan cover. I feel like I’m almost ragging on the guy too much, but this is seriously not a great piece of work. 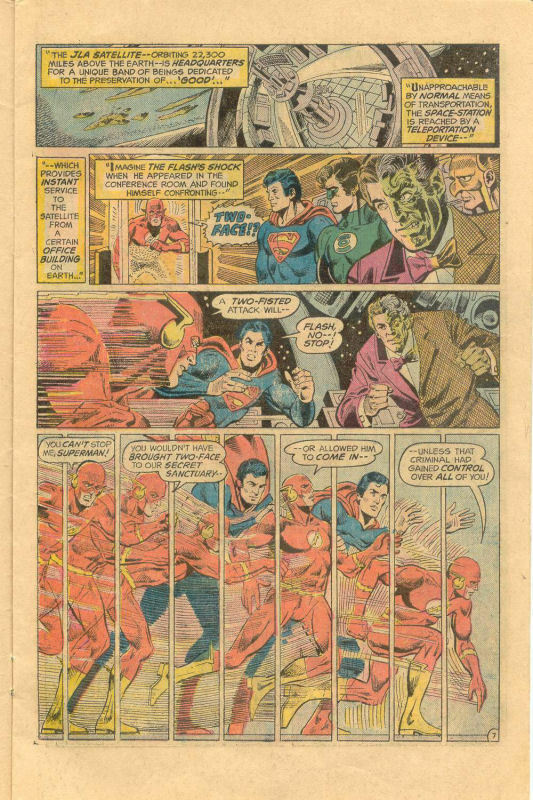 The idea of the image is fine, but if Flash is running on the ground, then the rest of the JLA are standing in a hole. And Two-Face looks bloated and lethargic, as though he’d just finished a heavy Thanksgiving dinner or something. Extra points for the “He’ll double-cross you” cover copy, though. 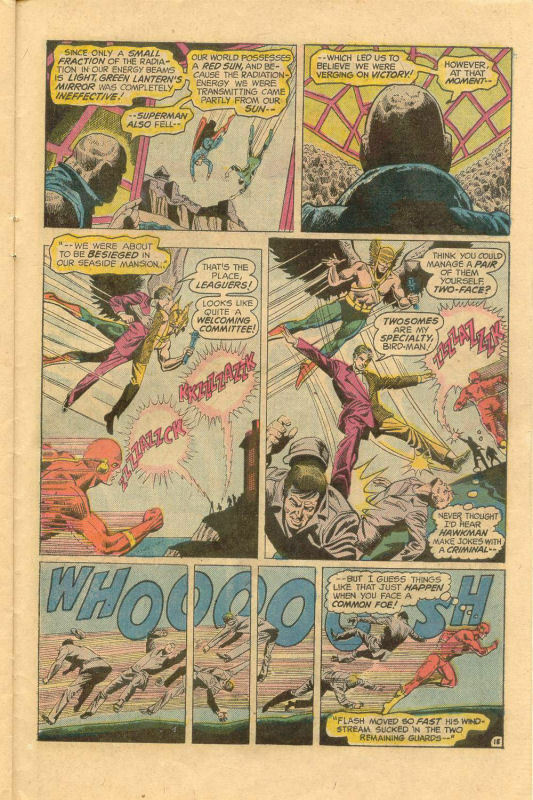 This is the first issue of the series written by Gerry Conway, who would go on to become the regular scripter of the book and rack up almost 100 issues’ worth of stories for it. 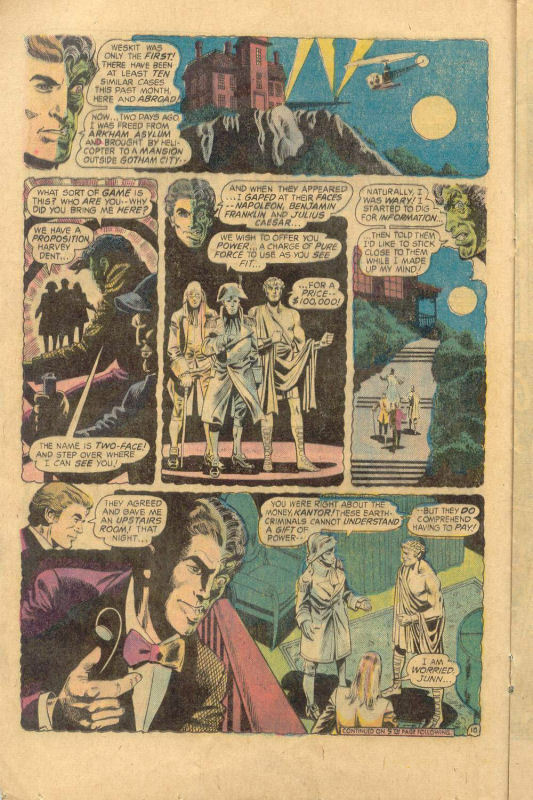 As was Gerry’s style in those days, he attempts to bring a more Marvel-style of continuity and universe to the series, hence the involvement of Two-Face from Batman’s world, as well as the villains who turn up at the end of the issue. The book opens with Green Lantern interceding in the theft of some specialized computer equipment from STAR Labs. Or attempting to–as the Emerald Crusader is struck down when one of the thieves suddenly blasts him with energy. The bad guys escape, and this escapade is observed by shadowy no-goodniks. 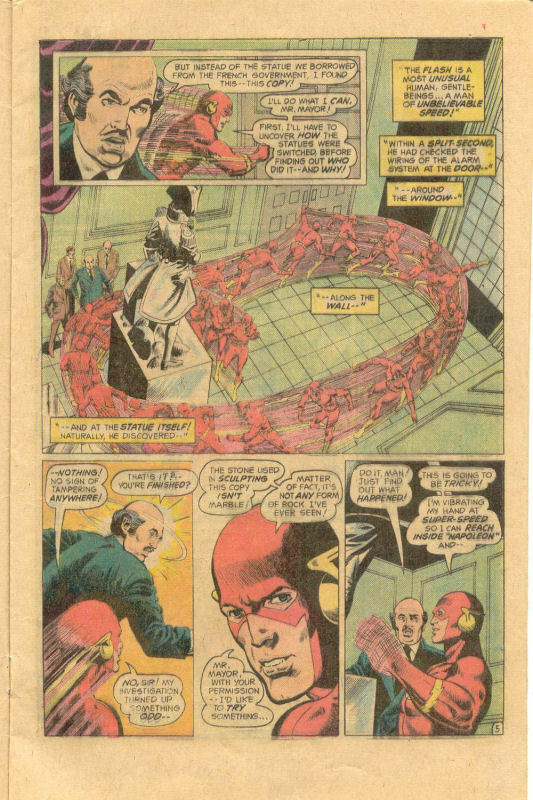 Meanwhile, in Central City, the Flash has been called in to investigate the theft of a statue of Napoleon. 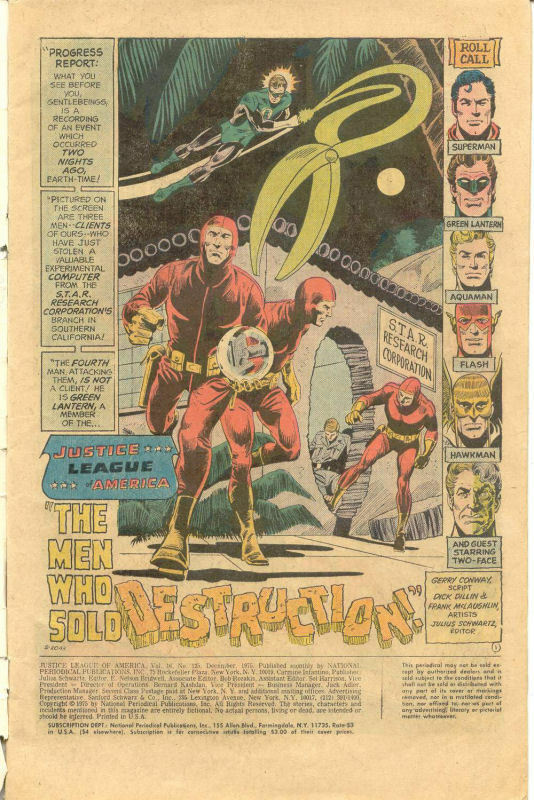 The Scarlet Speedster works out that the copy left in its place was made of a material not found on Earth, but he’s summoned away by a JLA alert before he can pursue matters any further. Beaming up to the JLA satellite, Flash is surprised that Two-Face is in attendance at the meeting. Rather than hear an explanation, he assumes that his colleagues are under mind control and attacks, leading to a short and pointless fight scene as the other Leaguers subdue him. Two-Face reveals that he’s come seeking the help of the JLA, as Batman is unavailable. 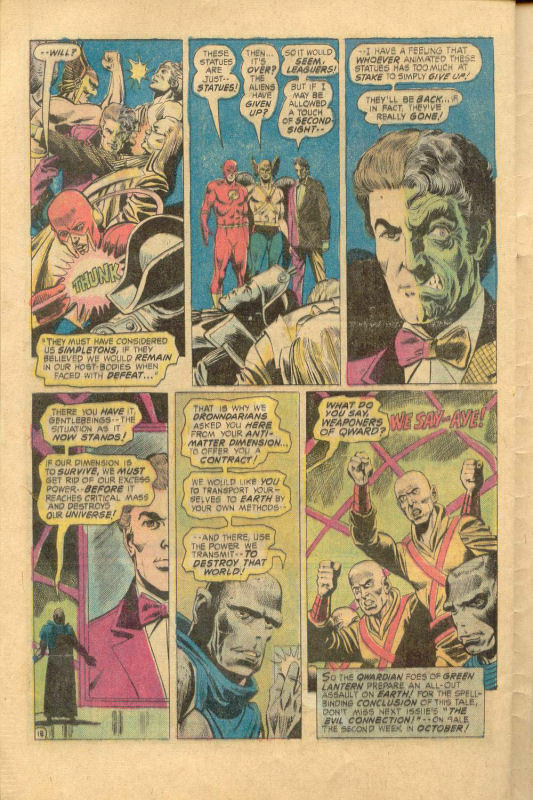 Two-Face reveals how he was freed from Arkham Asylum by a trio of aliens inhabiting animated statues–including the statue of Napoleon just to tie this all together–who offer to give him similar energy-blasting power to what the crooks who flattened Green Lantern used, in exchange for a payment of $100,000. Investigating that night, Two-Face learned that the aliens didn’t care about the money, but needed to siphon off destructive energy from their own universe into ours, using the criminals as a conduit. If enough energy is transferred, their world will be saved and ours destroyed. Flipping his coin, the clean side came up, and so Two-Face went to the JLA to rat the aliens and their plans out. Just then, an alert comes in from Aquaman. There’s a massive break-out going on at an Oceanside prison, as the inmates have all suddenly developed energy-casting powers, and he needs back-up. 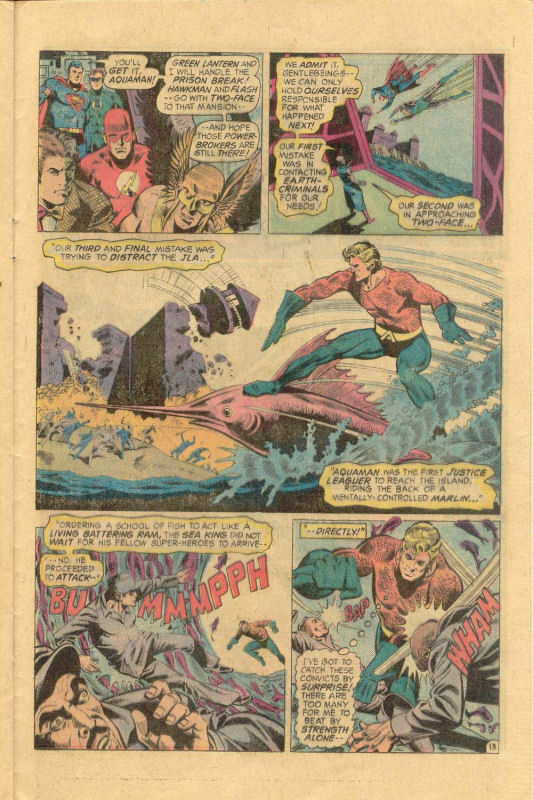 The JLA splits its forces, with Superman and Green Lantern racing off to join Aquaman in quelling the jailbreak, while Hawkman and Flash go with Two-Face back to the mansion where he was recruited by the alien overlords, hoping to catch them by surprise. In each location, our heroes face action-challenges.